I love the idea of serving dessert in a jar....it looks so sweet...no the other kind of sweet...you know, as in, cute/adorable. But, it was also sweet, the way any good dessert should taste right? 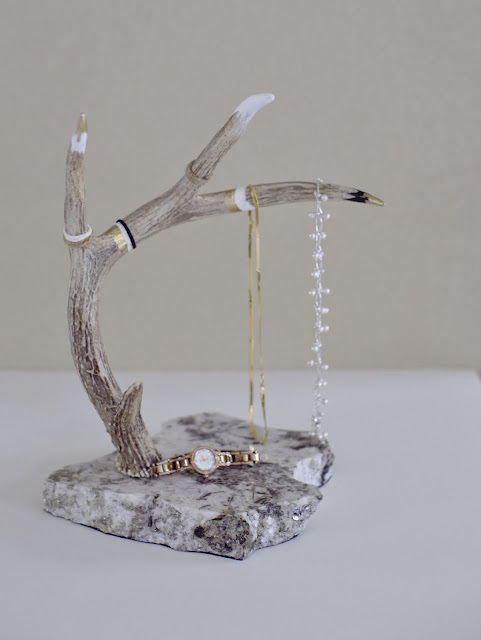 I actually made this for the styled shoot I just collaborated on with my daughter. I made a "two spoon" version using a small mason jar, but I could see making these for guests in smaller jelly jars; the perfect portion for just one person! You will find some recipes that use chocolate pudding and marshmallow fluff along with graham crackers....in that case, you need a kitchen torch to toast the marshmallows. Since I don't own a kitchen torch, I opted for the version that you toast under the broiler with a cake or brownie middle. I can't site a specific recipe, since I combined some ideas from various recipes that I read.....I went really easy, avoiding any baking of cakes/brownies since my dessert was mostly for show. I started by creating a graham cracker base by crumbling several graham crackers, adding some melted butter and a touch of sugar. Then, I bought a small piece of cake (in the day old/clearance section of the bakery), some marshmallow fluff, large mashmallows and a chocolate bar (for garnishment). On top of the graham cracker crust, I crumbled up the cake and added it to the jar, alternating with some marshmallow fluff and one more layer of plain old crumbled graham crackers.....there is absolutely no science here.....I was layering based upon eye appeal.. Since I wanted the inside to melt a bit more, I put it in the microwave for about 20-30 seconds. The final step was the most fun.....I topped it with several large marshmallows and put it under the broiler to toast (put the mason jar in a dish with approximately 1 1/2 inches of water).....I kept the oven door open and turned it periodically so the marshmallows would toast evenly. A word to the wise......since I made mine the day before the shoot, the marshmallows had gotten crusty and of course it had cooled, which made it dry...so don't do that if you are making these for a dinner party or a special dinner date with your Significant Other. These need to be enjoyed warm out of the oven, you can assemble them, but save the microwave step and toasting until just before you are ready to serve dessert so everything is ooey and gooey. Put a couple pieces of chocolate into the marshmallows for garnishment and enjoy! If you do some searching on this topic, you will find some fun ideas for all sorts of party favors; baby showers, wedding showers, kids' parties, etc. I went another direction on this one and made some labels for my daughter's photography business. It was fun actually.....I made a prototype or two as a starting point and then we collaborated on the final design...could we change the font?, how about if we move that down?, is black too bold? All good questions, and All necessary discussions to land on the final look. Being a professional patternmaker and seamstress, I'm all about prototypes. I used my silhouette cameo to develop the final product; I chose a couple of the pre-made designs from the online store (the heart design and fillagree), but more importantly, I knew it would be a real timesaver when it came to cutting the labels. Because the label is only 1 3/8 x 3 3/4 it was important to see it printed along the way....looking at a "zoomed in" version of it while working on the computer, was really deceiving. So tweak and print was definitely a part of the process. There is a super cool feature in the silhouette software which allows you to duplicate the final design to make a page full in the click of a button! So once we arrived on the final template, I clicked and the entire page was filled with labels ready to printed. From there it was just a matter of buying some adhesive paper and feeding it through the machine for the cuts. I bought a 10 sheet package of Avery adhesive paper at Staples, which netted me a total of 60 labels for under $17. Voilà! Custom made labels. Aren't they cute? Removing the old labels is pretty simple; you can usually remove them in just a couple of large pieces. My daughter found a few online stores to choose from to purchase bulk tic-tacs (in all different colors if you want)....do a search and you will see the many ideas floating around out there, including some fun ideas for kids at holiday time. Whatever the occasion, this project has very little out-of-pocket costs while making a gift with some fun WOW factor. 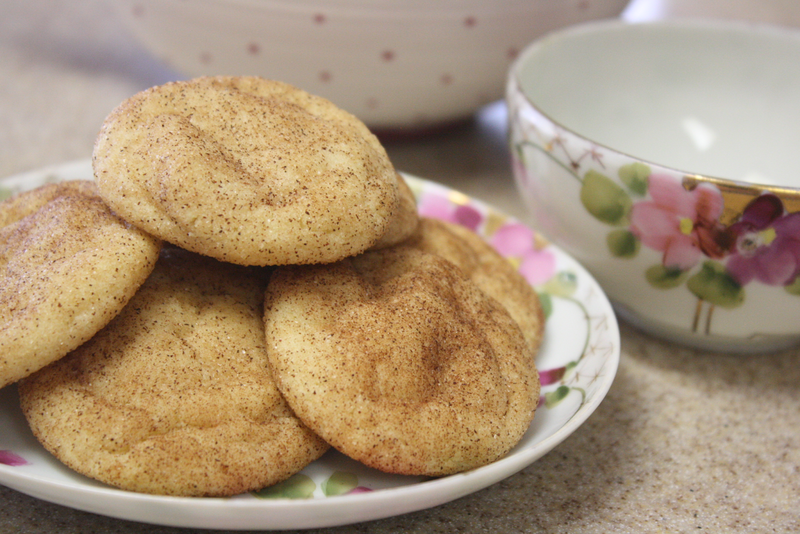 I love me a good snickerdoodle....and boy-oh-boy these are super yummy! I'm going to share two recipes, the first one was really good, but since it wasn't adapted for high altitude, they turned out a bit flat and I have a thing about super flat cookies; I'm sure they'll work great for those of you below 3,000 feet so feel free to give them a try. For me though, since I wasn't completely sold on them I kept searching for another recipe (one which was adapted for high altitude baking). I landed on one and tried it out this past weekend. Not only were these scrumptious, but they looked really good too....nice and plump, just like I like them! In a large bowl, cream together the butter and sugars with an electric mixer on high speed. Add the egg and vanilla and beat until smooth. In another bowl, combine the flour, salt, baking soda and cream of tartar. Pour the dry ingredients into the wet ingredients and mix well. Preheat oven to 300 degrees while you let the dough rest for 30-60 minutes in the refrigerator. In a small bowl, combine the sugar and cinnamon for the topping. Take about 2 1/2 Tbsp. of the dough and roll it into a ball. 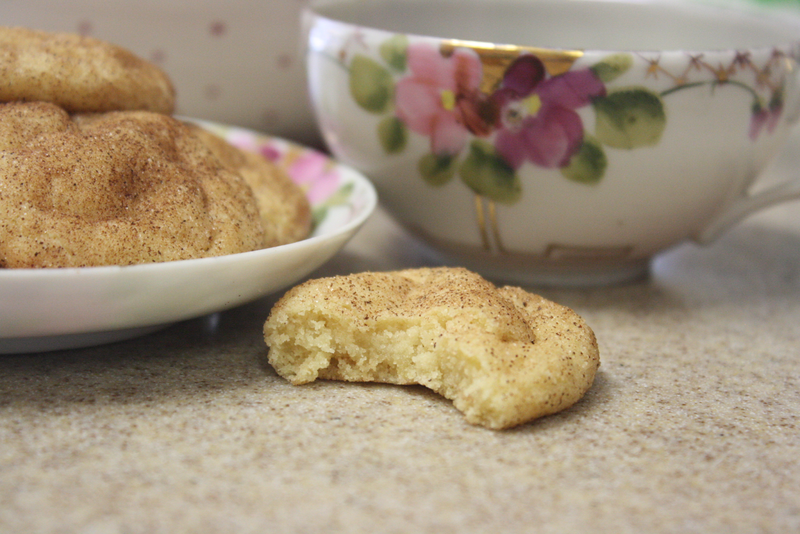 Roll this dough into the cinnamon/sugar mixture and press it onto an ungreased cookie sheet. Bake 12-14 minutes. The cookies may seem undercooked, but they will continue to develop after they are removed from the oven. Pre-heat oven to 350 degrees. Cream butter, sugar, and vanilla. Add remaining ingredients ending with the egg. Combine the 1/2 cup sugar and 2 tbsp. cinnamon in a small bowl. Take about 1 Tbsp. of dough and form it into a small ball. Roll in the sugar/cinnamon mixture. Bake about 7-10 minutes (I baked mine for 8 minutes since my husband and I like our cookies soft) until the edges of the cookie are slightly browned. 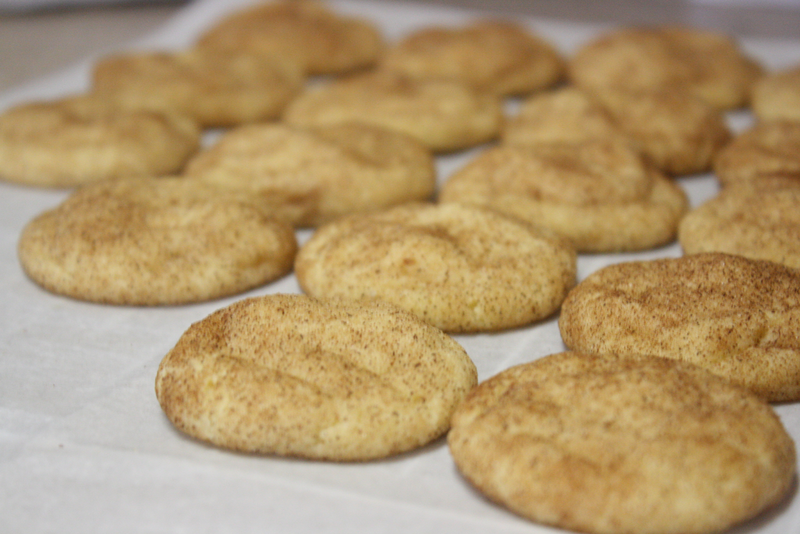 What's really cool about Snickerdoodles is you generally have all the ingredients on hand....so, when you need a cookie fix, you can satisfy that craving with some fresh baked cookies straight out of the oven in about 40 minutes. Enjoy!! Chalkboard art has gotten incredibly popular over the last couple of years. I decided to tackle a couple of different projects; one for me and one for an upcoming styled shoot that kb digital designs and I are collaborating on in just a couple of weeks. This sign I made for myself to put in my studio downstairs. Isn't she cute? The supplies are really simple. Just purchase a can of chalkboard paint....since it indicated a roller application was best, I bought a mini-roller and tray. When it comes to what to paint, that's totally up to you. I found this tray at Hobby Lobby in the clearance aisle; I knew I wanted a unique shape....so, with the chalkboard paint it was going to be just right. But, keep in mind you can use anything, including old frames or backing boards (the inserts in old picture frames), even the glass from a picture frame will work! I chose to use a combination of chalk and markers since this project is a permanent addition to my workspace. I found a font I just loved and some fillagrees; printed it using my computer and then did the old grammar school trick of shading the back of the paper with pencil and tracing over it; there's no way I felt comfortable free-handing this one, my handwriting is awful! Then, I added some leaves and flower buds as I went along. I loved the idea of using a doorknob for the hanger; I was able to find one at Hobby Lobby (50% off). I don't have a separate door to my studio (well I do, but it's the basement door), so I created my own front door, minus the door. On the tassels, I added two clip on earrings; keepsakes from my Mom's jewelry box. The chalkboard shown below is being used for the upcoming styled shoot, so I had to leave it blank to keep you guessing.......we'll be able to share photos from the shoot closer to the end of February. To start, I used an unfinished cabinet door. I shared another project I made with a cupboard door a few weeks back. This door cost me $6 and is made from a beautiful pine wood; nice and lightweight and knotty-just what this project called for. We'll be using plain old chalk to add the message to this chalkboard...and then we can just wipe it off and use it again and again.